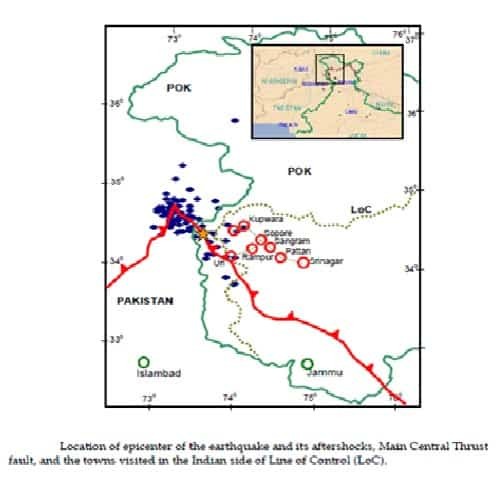 epicenter located at 34.493°N, 73.629°E (USGS), which lies in the Pakistan-occupied territory of Kashmir (POK). The epicenter is located at 19 km northeast from the major neighboring town of Muzaffarabad, which is 170 km west-northwest of Srinagar. This earthquake at a focal depth of 26 km. Tectonic plate moving northward at a rate of 40 mm/yr giving rise to Himalayan mountain ranges. Worst affected major towns on the Indian side of LoC are Tangadhar in Kupwara district and Uri in Baramulla district. The maximum of VIII at Uri, VII at Baramulla and Kupwara and V at Srinagar on MSK scale.Top two high risk seismic zones of IV and V of Indian seismic code IS:1893 with the expected intensity of IX or more in the zone V and intensity of VIII in the zone IV.Major civil engineering projects in the area are highways, bridges, small dams and micro hydro-electric projects and a few RC framed buildings.The housing units are largely low rise brick and stone masonry load bearing types often in association with timber.The diaphragms varying from pitched flexible roofs to mixed flexible and rigid concrete floors and roofs. Primary lateral resistance against the earthquake forces is provided by the membrane action of the diaphragms (floors and roofs) and bearing walls. In Kashmir traditional timber-brick masonry construction consists of burnt clay bricks filled in a framework of timber to create a patchwork of masonry, which is confined in small panels by the surrounding timber elements. No collapse has been observed for such masonry even in the areas of higher shaking. This timber-lacing of masonry, which is locally referred as Dhajji-dewari (meaning patch quilt wall) has excellent earthquake-resistant features. The army present in the area was the first one to respond for rescue and relief despite being seriously affected by the earthquake.